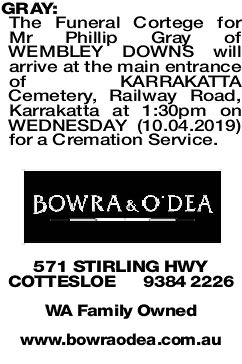 The Funeral Cortege for Mr Phillip Gray of WEMBLEY DOWNS will arrive at the main entrance of KARRAKATTA Cemetery, Railway Road, Karrakatta at 1:30pm on WEDNESDAY (10.04.2019) for a Cremation Service. GRAY PHILLIP Passed away peacefully on April 2nd. My much loved partner, you will always be with me. GRAY PHILLIP Sincere sympathies to Anneke and family on the passing of Phil. Remembering happy times. Love Sue, Tony and family. GRAY PHILLIP ALEXANDER Thank you for being a great friend. You are now in God's hands, he will take care of you. Rest in peace mate. Denise and Chris.